Eléonore: Hello Bao, thank you for taking the time to do this interview. Could you please tell us about your first months working at BTC.com? Bao: I started a couple of months ago but it already feels like a while, as it was a very intense start and so many things have happened! For example, we had a booth at Chainges and TheNextWeb conference, where the whole team gathered to teach attendees about how cryptocurrencies work. Eléonore: What did you learn while attending these conferences? Bao: These conferences substantially increased my knowledge about digital currencies. I understood the potential of blockchain technology across multiple industries and I realised how the BTC.com wallet fits into a larger ecosystem. Through buying, spending and storing cryptocurrencies, online wallets are the gateway into this space. Eléonore: Could you please tell us more about your position at BTC.com? 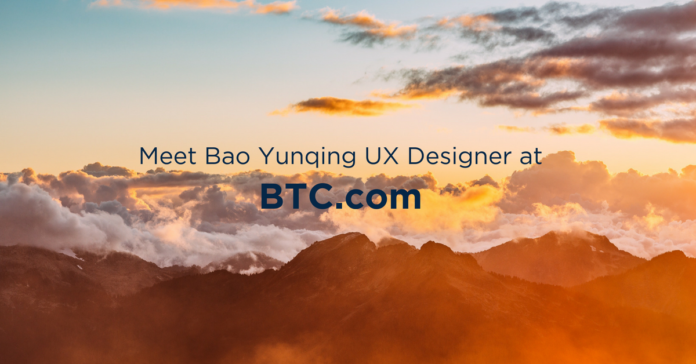 Bao: I’m a User Experience Designer, making sure that our users get the best user experience when using our wallet. As such, I’m currently conducting a lot of research to develop the best product. I work very closely with our Visual Designer, we make sure to combine our visions to develop the wallet with the most innovative features. Eléonore: As a UX designer, how do you see our industry evolving? Bao: I believe that our industry will not completely substitute the banking system but it will complement it. Soon, buying cryptocurrencies from a ATM machine will be as intuitive as withdrawing cash. Eléonore: What do you think about the cultural differences in mobile payments in China versus Europe? Bao: Indeed, mobile payments are the norm in China. QR codes have been a good medium to go from the offline world to the online world and vice versa. They look like Chinese characters, their square shape makes them familiar to use and interact with. However, here in Europe, QR codes look very alien and therefore are not very popular. Eléonore: Do you think we should try to make QR codes great again? Bao: We have to innovate. Look at WeChat, you can do everything with their app and QR codes are a large part of it. In Europe, people use WhatsApp or Messenger where the QR feature is absent. If these apps would implement this QR code feature, Europeans users might welcome mobile payments faster. This could have a positive effect on mass adoption of cryptocurrencies, where QR codes are very much used. Eléonore: What has been the most challenging aspect of your work as the UX designer of a cryptocurrency wallet? Bao: If you’re developing an e-commerce app, you can grab anyone in the street to test it, but in our industry everything is new! That’s maybe the biggest challenge for me, the lack of informed users and reference points from different apps. On the other hand, we can innovate and stay ahead of the game. We are still in the early days of this industry, we can be front runners, observe our competitors and do better. It’s like WhatsApp and WeChat, WhatsApp was there first but WeChat became the innovator.